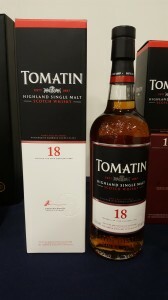 I had tasted a Tomatin 18 years old whisky in couple of years ago. It was indeed a good whisky, detailing and balancing. Recently I have got a sample of the current bottling. It is a good opportunity to compare any differences between them. Comment: Quite sweet aroma, candies and dried fruit, good to have some spices to balance, lovely baking aroma. Rich and full in mouth, citrus like sour, followed by toasty favours. Long aftertaste, woody and toasty, chewing. Comparing to my previous tasted sample, their favours are quite different, this one more spicy and “ordinary" Sherry cask favours. Notwithstanding that the differences, both Tomatin 18 are detailing and balancing, good whiskies. P.S. May not the whisky itself changes, perhaps the people change.